I've bought a lot of bags over the years in pursuit of just right and I've been let down many times. There is the thrill of getting a new bag and stuffing it with pens and notebooks and stuff I will end up never actually using. Then, I get the new bag out into the world and the flaws quickly reveal themselves. The bag is not sturdy enough. It's stuffed too full. There is no place for the book I checked out from the library. The zippers are too tight. The zippers are too loose. My water bottle does not fit. Blah, blah, blah. A few months back as I read the Marie Kondo books and did my tidying, I took all the bags I had out of various places in the house (I had bags in two closets, behind the door on a hook and in a tote in the attic. I told you I had a problem!) and I dumped them all in one pile and made the tough decisions. 75% of them went off to the thrift store. 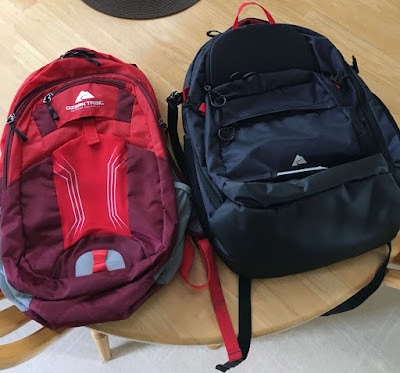 I had my work backpack, my personal backpack which I have taken to different school events the kids are involved with and to the coffee shop or the doctor's office and even to the scrap yard when I was looking for parts for the Buick. I also kept a little bag for the car. That's all I need, I told myself. There was more than a little relief when I bagged up the rest of the bags for the thrift store. Fast-forward to Monday when I packed my personal backpack with various tech stuff so I could work while the kids had ortho appointments, a book, and a water bottle and the flaws revealed themselves after two years of use. The bag is still usable but is getting flimsy. Although I pack my Asus Transformer and iPad in padded sleeves, the bag is still just a tad too lightweight for everything I was stuffing in it. My old bag has served me well for two years and will still be used for light, non-tech duty. I went to Walmart Wednesday and bought a new bag from the same company that is a little bit bigger and features a lot more padding. Why write about something as mundane as buying a new bag? Because, in the pre-tidying, pre-purging days, I probably would have endlessly scrolled eBay and Amazon listings until I found something that just might work and I would have ordered it and probably been disappointed. No more! I went to actual stores (I know, that's so old-fashioned!) and examined the bags in real life, going through them, zipping, unzipping and trying them on until I found the right bag for my needs. As Marie Kondo asks, did it bring me joy? I had several that I found at Staples and Office Depot that almost brought me joy but just didn't seem quite right. It does take a lot of time going store to store to find something but I still feel like I saved time going place to place versus spending hours of surfing websites and then having to possibly deal with a return or, even worse, getting a bag that ended up in the closet or in a tote until it eventually went to the thrift store. I've done that way too many times with bags, radios, you name it. Plus there is the anxiety I get of being overwhelmed by choices online. I know that might sound silly but in the past, I have woke up in the middle of the night thinking about something I need and some new parameter I can search on to narrow it down so I would end up in the bathroom or living room on my iPad in the middle of the night shopping. It sounds silly to admit that here but I can't be the only person doing it. At a time when Amazon seems to be taking over the world, there is still a place, at least to me, for bricks and mortar retail stores. Online shopping is great but it can also be overwhelming and can result in a lot of "almost just right" purchases that I know from experience can end up being quite wasteful.